Keeping patches and plugins up to date in Windows is impossible without using monitoring software, or regularly using a web page to check whether any installed software has any new updates available. Just setting ‘Windows Update’ on automatic is not enough. Relying on plugins, like Flash or Divx, or hundreds of others, to just update themselves is a recipe for turning your computer into an infected spambot. 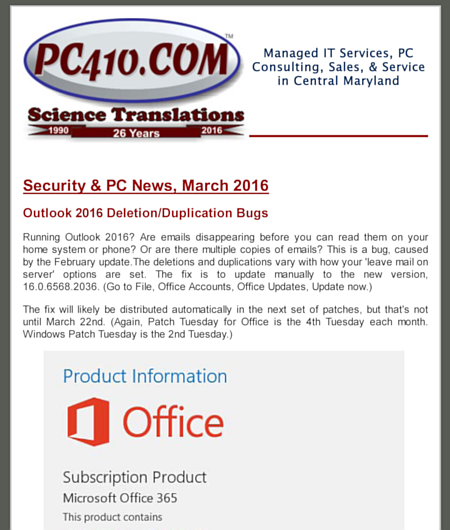 Over on our hardware and local PC service site for Westminster MD, PC410.com, there’s an article, “How do I maintain my Windows-based computer?” that lists all the basic computer maintenance steps, and has instructions for keeping your computers up-to-date and safe. Flexera Personal Software Inspector, formerly known as Secunia PSI. PatchMyPC, on the ‘Free Updater’ page. Mozilla‘s plugin-checking service for FireFox and Thunderbird.